For anyone wanting to train for their Potential Royal Marines Course or Potential Officers Course, this eBook contains all my recommendations, training methods and an eight week training programme. What do you get in the Pass the PRMC eBook? Breakdown and explain the PRMC in detail day by day. Insider tips from an ex Royal Marines PTI and Recruit Troop Commander. In depth details as to what is tested and the techniques required to pass. Detailed training ideas to improve all areas of PRMC. Specifically: press-ups, sit-ups, pull-ups, running and mental strength. Tips and advice for improving mental strength to obtain the Commando Strength of Mind. An 8 week specific PRMC training programme designed to improve every aspect for any candidate. The only PRMC specific book written by the author of the Official Haynes Royal Marines Fitness Manual. Advice on nutrition to maximise training potential for PRMC. Less than £10 for a 26,000 word eBook including information on the PRMC you will not find anywhere else. Amazing book, gives you everything you need to know about the PRMC and I can’t wait to begin the programme! Thanks Sean. Covers all bases, a must for a potential RM recruit. Answered every available question I had to ask. Thank you Sean. This deserves at least a 6th star. Written by a true professional and an excellent marine. An impressive bargain. Would highly recommend this book to anyone looking to join the Royal Marines. Sean’s knowledge and expertise is top notch!! Hoofing read Royal. This book has everything for someone with little to no knowledge of the PRMC and extra details for those who have done their homework. Another great insight from S. Lerwill into the state of mind and work ethic required for a RM. 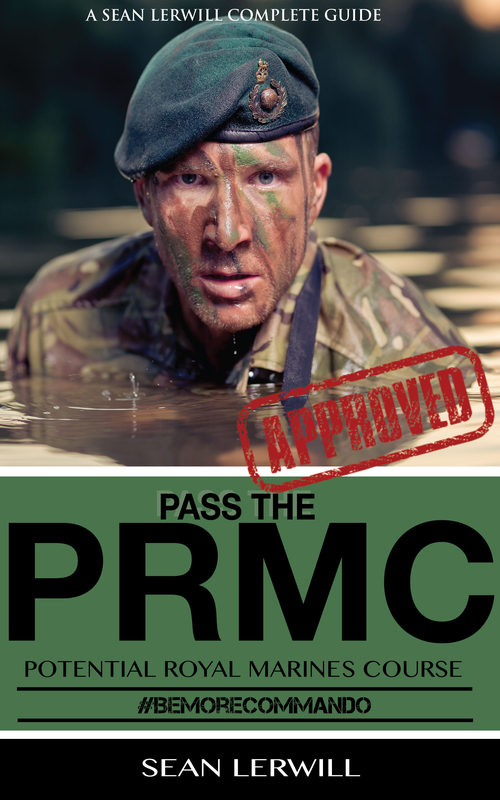 Serious about wanting to pass the PRMC? A must read. If you are looking to join the Royal Marines then I would suggest this book becomes your ‘must have’ guideline and that you follow it and learn from it. If you are just interested in gaining an insight into what is probably the hardest Military training in the world, then this is also a great read for you. A 3rd group who might read this book is that if you have a son or brother, maybe a boyfriend or husband who is looking to join the Royal Marines, this book will give you an insight into just what they will face. Hopefully meaning you will be able to give greater support.